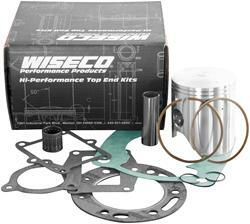 Wiseco powersports piston kits include your rings, piston pin, and circlips. These 2-stroke kits feature Pro-Lite pistons that are CNC-machined for optimal cam shape and profile, horsepower, and service life. Wiseco has a decade of experience producing quality pistons for dirt bikes, ATVs, snowmobiles, outboard marine engines, and motorcycles. Their piston kits offer strong, lightweight pistons with optimized designs to improve engine efficiency and maximize your torque and throttle response. Plus, Wiseco powersports piston kits are produced right here in the USA. It's time to blaze your own trail with Wiseco powersports piston kits.